"Subjects with PFP(patello femoral pain) have a higher prevalence of MTrPs (Myofascial trigger points) in bilateral GMe (gluteus medius)) and QL (quadratus lumborum) muscles. They demonstrate less hip abduction strength compared with controls, but the TPPRT (trigger point pressure release therapy, AKA ischemic compression) did not result in an increase in hip abduction strength. " It is not surprising that when the hip is involved, the knee will be involved. As Dr. Allen often likes to say "the knee is basically in joint between 2 ball and socket joints ". The gluteus medius and quadratus lumborum, along with the adductors are coronal plane stabilizers of the pelvis. They both have rotational components to their function as well affecting the hip directly for the former and lumbar spine for the latter. You can see our other QL articles about this here and here. It is not much of a stretch to imagine that dysfunction of these muscles could result in trigger points and/or dysfunction of the knee (or foot for that matter ) could cause trigger points in these muscles. 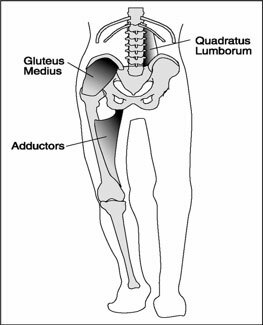 Here is an article (1) examining trigger points in the gluteus medius and quadratus lumborum which, if you are familiar with Porterfield and DeRosa's work (2), are intimately linked during gait. We found it interesting that skin nick compression did not increase hip abduction strength where we find dry needling and intramuscular therapy often do. Don't overlook these muscles and this important relationship.